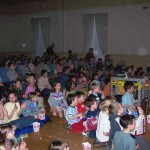 Friday Night at the Movies runs October through March. 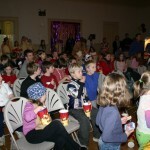 We show animated movies for children from 6 to 8 pm usually on the 2nd Friday of the month. Parents are welcome to watch also. Our popcorn is the same popcorn supplied to Fenway Park and the kids eat all of it every time. The SCCF pays annually for a film license that allows movies to be shown to the public free of charge.